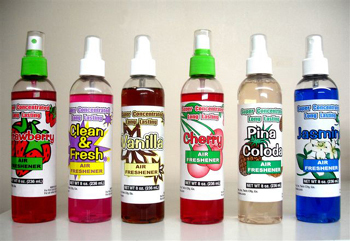 Assorted Case - Hunter's Sales, Inc.
Air Freshener assorted case of (12) 8oz. pump spray bottles. Each case contains 2 bottles of each scent Cherry, Clean & Fresh, Jasmine, Pina Coloda, Strawberry and Vanilla. Air Freshener Variety case of 12 contains 2 bottles of each scent Cherry, Clean & Fresh, Jasmine, Pina Coloda, Strawberry and Vanilla.